Deck your Halls and Play Games for the Holidays – Friday Tabletop Kickstarter Update! Hello! 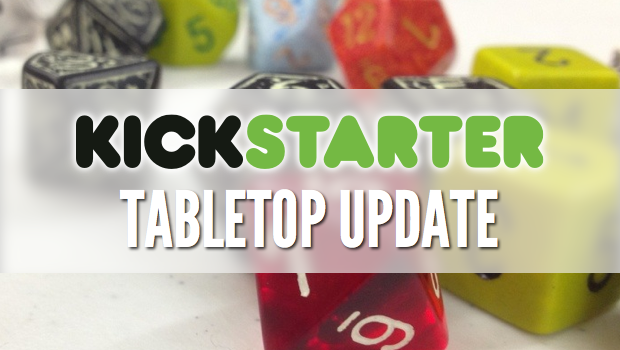 Welcome to 2014’s last Friday Tabletop Kickstarter Update! For info on what is going on here, check out this introduction. To get them all in, I had to fit a few more in than usual. There are certainly some great games in this bunch. Too bad you won’t be able to give them as gifts in six days. With card drafting being all the rage on the mean streets of boardgaming, PBL Robots presents an interesting robot construction and battle game. Each player strives to customize their robot in order to damage their opponent. I really like what they are doing with various cards, it looks very different than other drafting games. Go get your robot on now! At first glance, I did not pay too much attention to Viceroy. It looked like a game trying to be more than a filler with a disproportionately high art budget. Upon further inspection, I realized that Viceroy was much more than I assumed. The game play revolves around bidding on cards to then add them to a pyramid of other cards, where placement is key. I am a converted skeptic. I am now a backer. Part of my sway was watching some of the reviews they have posted. Genre: MOBA style strategy game, Pirates!, Miniatures! CoolMiniOrNot is at it again with their 14th tabletop campaign. The latest, Rum and Bones, takes a hint from popular online battle arena style games like League of Legends and DotA pitting two teams against each other in relentless combat. Each team has an endless stream of minions that march forward in a pre-programmed fashion. Overflowing with plastic, if you are even a little interested, this is one ship you want to jump on. What is better than a good game? A good game with super components! Taluva was originally published in 2006 and is being upgraded with bigger and better components. In this game players build up an island using single and multiple hexagon tiles all the while building up their own buildings and towers. Plenty of information can be found on the previous editions. This should be just as good. Two this week?! Yes, Pixel Tactics is also getting a revamp with a deluxe version. Our very own, Joseph Pinchback, reviewed Pixel Tactics not too long ago. This game has been well received and lauded for its simplicity and theme. If you have been waiting for all of the editions to be crammed together, now is your chance. A game about collecting boardgames! Something that is near and dear to a significant swath of hobby gamers. I don’t think this is being made to climb to the top of the ‘Game of the Year’ lists, however its use of current IPs and its nostalgic use of older games is going to speak to a few enthusiasts. I know plenty of people who would do well to add some color to their walls. These minimalist posters are just the thing to pay homage to some great games while still being subtly powerful. If I was not married to an artist who uses our walls as her own gallery space, I would be getting all five of these. If you celebrate any holidays this time of year, I hope you spend them gaming. Even if you don’t celebrate any holidays, go play some games! I will see you in 2015 with more Kickstarter Updates!